The funding for the Indiegogo Banned on the Hill Project is successfully completed. November 10, 2013 note – Please see the new update on the shows in Washington, DC and Calgary, Alberta. See the full campaign updates below as it unfolded on the streets of Ottawa, Halifax, Calgary, Washington and in media from across Canada, to the USA and the UK. 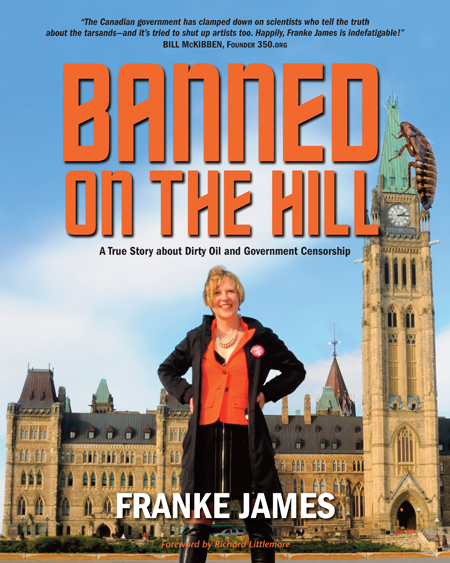 Banned on the Hill: A True Story of Dirty Oil and Government Censorshipfrom Franke James on Vimeo. 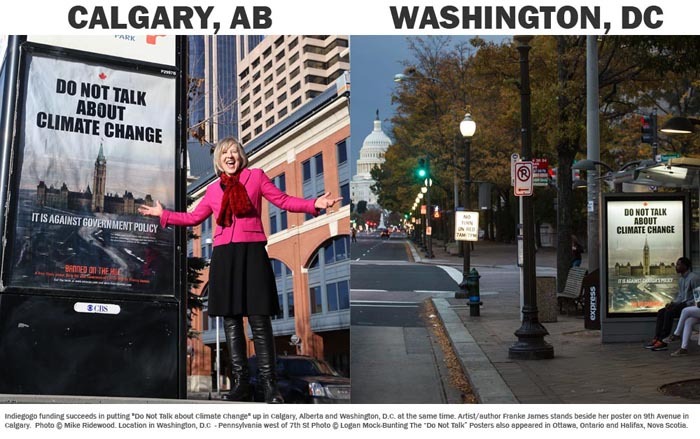 November: Double-Header: “Do Not Talk about Climate Change” posters go up in Calgary and Washington! September: Banned on the Hill Goes to Halifax! May 26: Banned on the Hill is 100% funded! May 22: Perks are already being delivered! 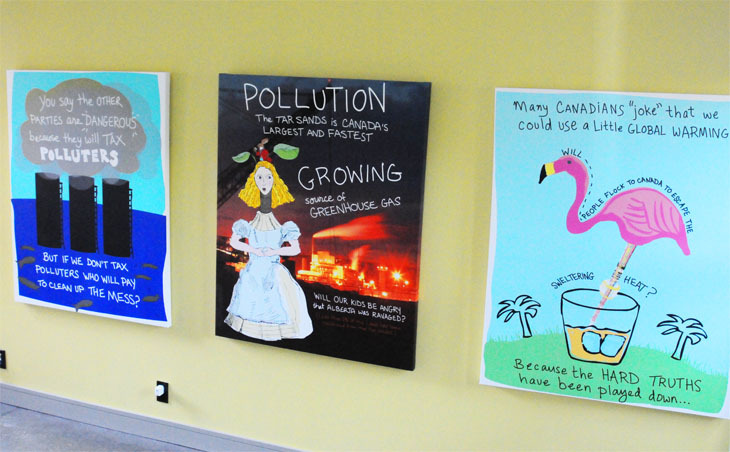 Double-Header: “Do Not Talk about Climate Change” posters go up in Calgary and Washington! With this double-header we’ve definitely achieved our stretch goals — even beyond my dreams! 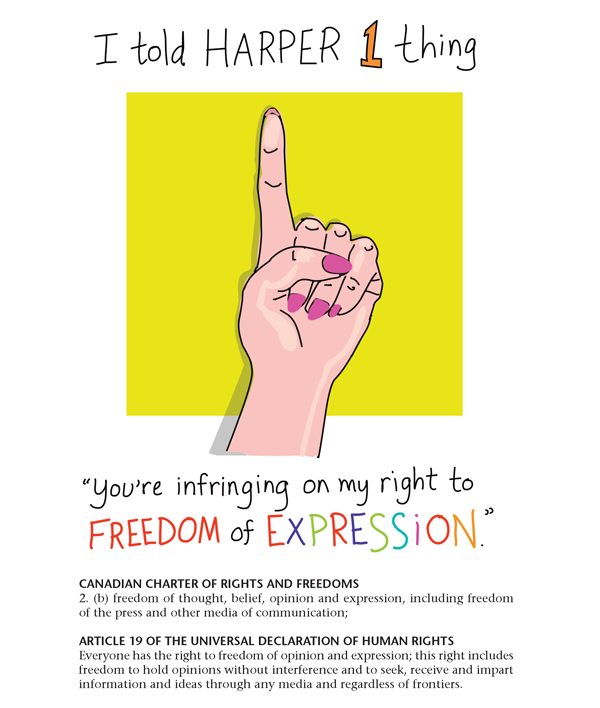 I have a lot to tell you about the Banned on the Hill posters that are up now up in Calgary and Washington. But first I want to start by thanking YOU – because without your help, this climate art project would never have happened. As I fill you in on the news, I think you’ll be amazed at how the project has gained momentum. It launched in Ottawa in the Spring. And in September it made waves in Halifax. As word travelled it attracted major supporters which made it possible to hit the ball out of the park and right onto Pennsylvania Avenue in Washington, D.C. Wow! Washington, DC: Indiegogo funds helped put the “Oh No Canada!” art show on the streets of Washington. Three major environmental groups in the USA also stepped up to help: NRDC, Sierra Club, and National Wildlife Federation. See the six posters and the media coverage. The “Oh No Canada!” show was kicked off by a climate symposium at the National Press Club on October 11th. Dr. David Suzuki, Tzeporah Berman, Dr. Danny Harvey, Tim Gray and myself formed the Canadian Delegation panel. On October 10th, members of the Canadian Delegation, including Clare Demerse from Pembina, and Courtenay Lewis from Sierra Club, met with Democratic Congressional staffers and State Department officials. INSIDE CLIMATE: Artist Blacklisted by Canada Over Criticism of Climate Policy Takes Show to U.S. 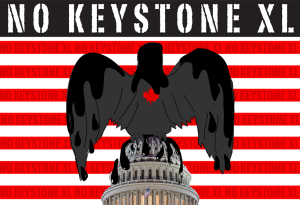 THE HILL: Anti-Keystone XL poster campaign hits Washington, D.C. Thank you so much for your contribution! YOU made a big difference. Together we’ve told Harper we’ve had our fill. We will not be Banned on the Hill. Please spread the word about the shows in Washington and Calgary! Do Not Talk about Climate Change? Ha! That is what the Harper govt would love, but more and more Canadians are standing up and saying we’re not going to be muzzled. 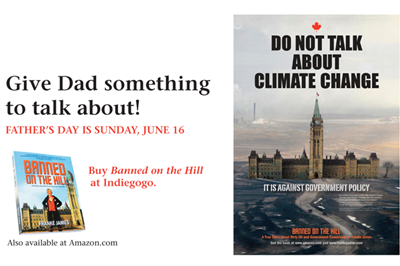 “Banned on the Hill” is on a roll thanks to Indiegogo funders who contributed to get the Do Not Talk about Climate Change posters up… First in Ottawa. And now in Halifax! Halifax welcomed me and nine of my Banned on the Hill posters — in great style. Phenomenal! Amazing! I got a very warm hug ‘down East’. One Indiegogo funder in particular gets special thanks for making this happen: The College of Sustainability at Dalhousie University purchased my “perk” to give a keynote talk and a Green Conscience Art Workshop (co-sponsored by the Dalhousie Art Gallery). See the full post and pictures of all the protest posters. Please share this news and get people talking about climate change! Greetings everyone! 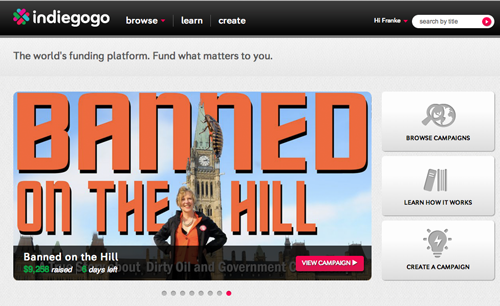 The Banned on the Hill campaign has wrapped up on Indiegogo. Thanks to you and 220 funders we raised $12,869.00 in 45 days. Yes!! We are 257% funded. This is a moment to celebrate. You can feel proud that you are making a difference in a very tangible way. 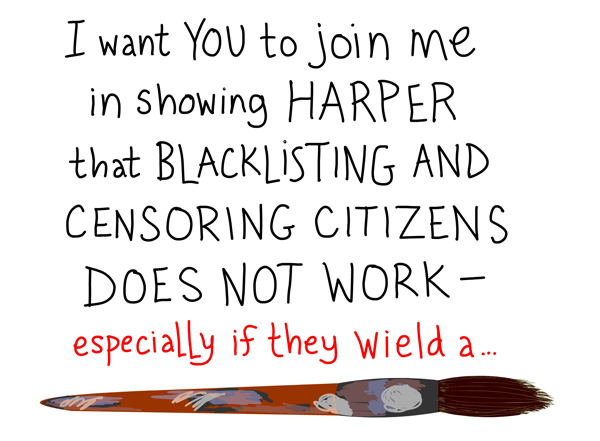 Together we are showing Harper that blacklisting and censoring citizens does not work — especially if they wield a paintbrush, and have great people like you on side! We will be taking the campaign to other cities and finding fresh, creative ways to get more public participation and media attention. I will be in touch to let you know the plans… If you have media or environmental contacts in Halifax, Vancouver, Calgary or Washington, DC, who you think could help, please put them in touch with me. – The books are ready to ship. – The Tarsands poster is ready to ship. – The stickers and tattoos are being produced. If your perk included several items (the book, the poster and the tattoo) it won’t be mailed until all the items are ready to ship. I hope you are enjoying being part of this activist campaign. This is very exciting! So glad to have you on-board. If you have any questions or advice, please email me. Thanks for joining me on Banned on the Hill! We got Go Go Boots? Well, kinda… We got the “GoGofactor”!! Banned on the Hill made Indiegogo’s front page! 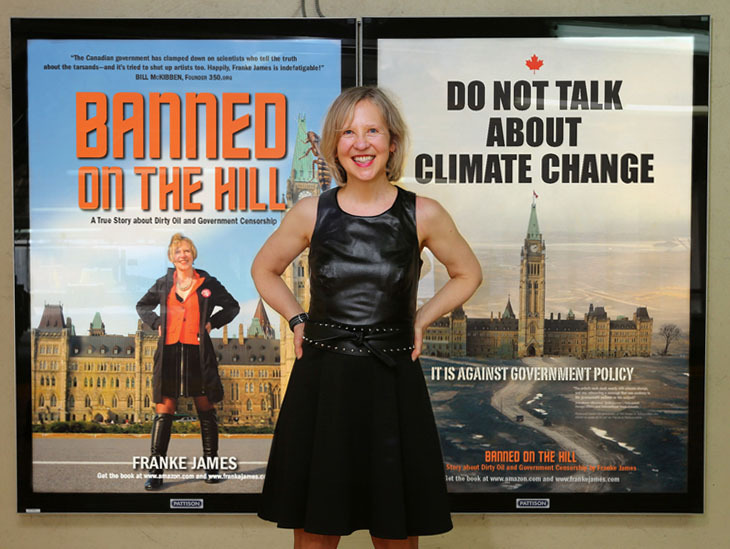 To the chagrin of the government, Banned on the Hill is succeeding in getting people talking about climate change —> The “Do Not Talk” posters went up on the streets of Ottawa and on one of the govt’s favorite sites. Can you hear the Buzz? From the UK to the USA and across Canada, we scored excellent media coverage in the Guardian UK, CTV Power Play, the Toronto Star, the Ottawa Citizen, the Montreal Gazette, the Vancouver Observer, the Globe and Mail, and GRIST Magazine in the USA. And there is MORE media to come. 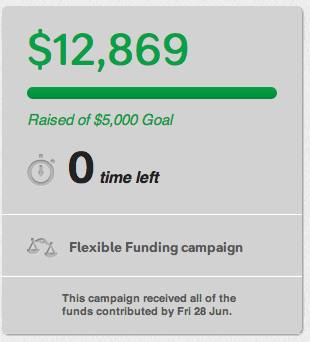 Yes, we’re at 185% of our funding goal. Which is DAMN good! But we can do better. Even though it’s summer, there’s a chill in the air. Many people are afraid to speak up lest they be pushed into a corner and labeled “radical”. If you think carefully, there are probably people you know very well who you are afraid to talk to about climate change. I know because I feel it too. We naturally ZIP our lips because we don’t want to antagonize people. But remember, there’s nothing radical about wanting clean air and clean water. We need to be brave and SPEAK UP about climate change. 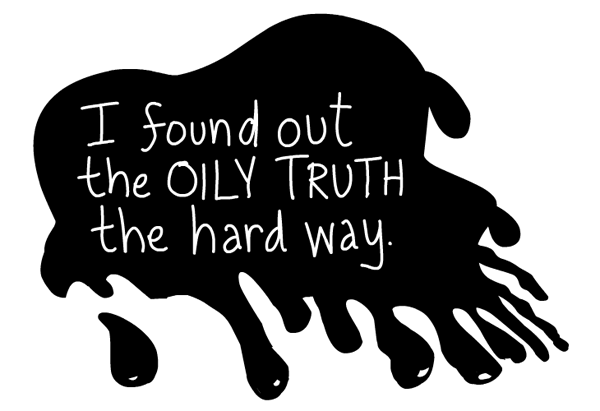 We need to show our government and Big Oil that we will not be silenced. They may not like what we have to say but it is our right to speak up. Green voices must be heard. Let’s hit the ball out of the park. 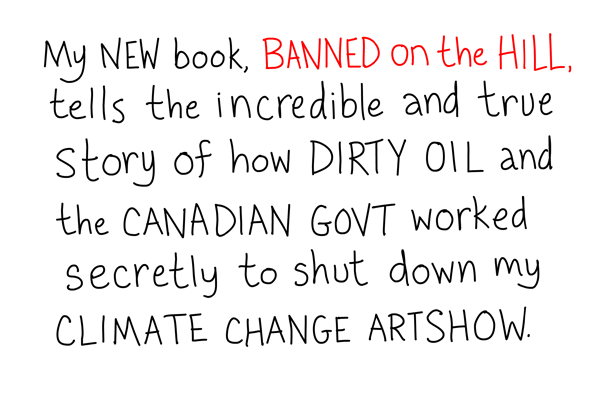 Let’s take my Banned Art — the same ART that the Harper government did NOT want the world to see — and spread the message further. Let’s take the show to Washington, Vancouver or Calgary. Buy a Banned Perk so we can take the show to another city! 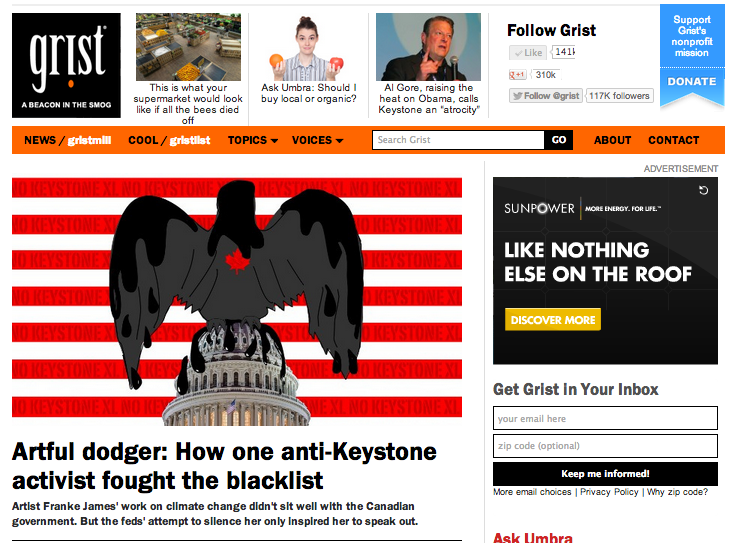 June 17: BIG News — Interview in Grist Magazine! Seattle-based GRIST Magazine, one of the top environmental news sites, published their interview with me about being “Banned on the Hill” and how I am fighting back. “Canadian artist Franke James knows how to convey gloomy information without being a downer. She takes a relentlessly cheerful, self-deprecating approach to issues too often screamed about by scolds and trolls. 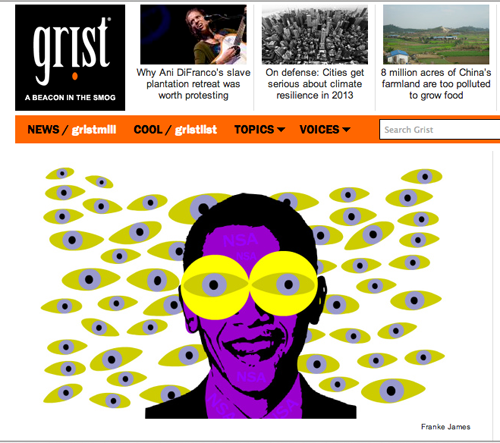 (It’s an approach we here at Grist admire.) Her illustrated essays call out individuals, corporations, and governments for their inadequate responses to environmental threats, but in an unfailingly good-natured way more likely to make you grin than grimace. 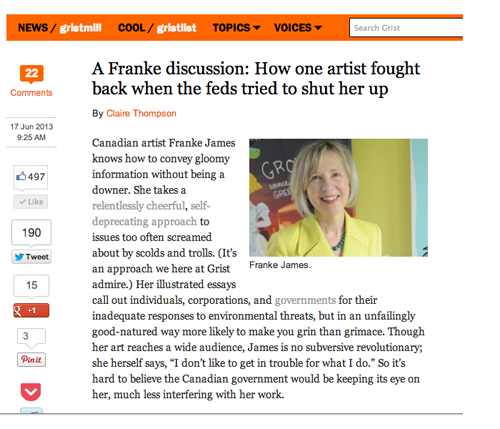 Though her art reaches a wide audience, James is no subversive revolutionary; she herself says, “I don’t like to get in trouble for what I do.” So it’s hard to believe the Canadian government would be keeping its eye on her, much less interfering with her work. Please read and share so that we can get more supporters and take the show to Vancouver, B.C. or Washington, D.C.
Two weeks to go and we’re getting closer to realizing the ambitious goal of taking the ‘Banned on the Hill’ campaign to another city. People are coming forward and offering help… we may just do it if we can keep the momentum going. I’m also announcing a new perk — Art Bookplate Stickers. You get to choose four Banned on the Hill bookplate stickers. 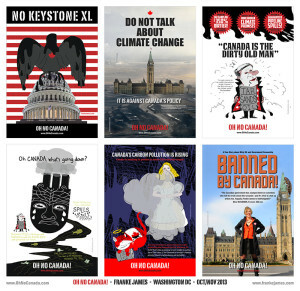 The selection includes the No Keystone XL Flag (featured here), What is Harper afraid of?, Joe Oliver riding a fish, George Orwell on political language, “Franke James is your fault?” and others… I’m also open to requests, so if there’s an artwork from my book that you’d like to see transformed into a sticker let me know! Very cool news — I’ve been invited to submit the stickers to an international art show curated by Catherine Tedford and Oliver Baudach. Read about the concept here: Re-Writing the Streets: The International Language of Stickers Please keep spreading the word. I’ll be in touch with more news as it develops! Hooray!! Wave a Canadian flag! Celebrate the win — but not for too long! 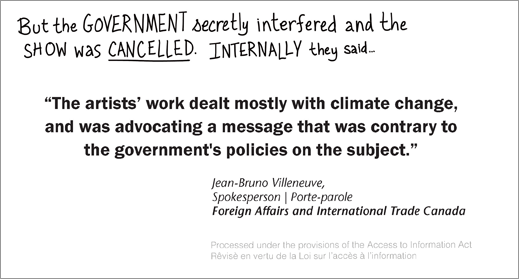 Yes, thanks to your contribution and 141 funders from Canada, the U.S. and Europe, we got the “Do Not Talk about Climate Change” posters up in Ottawa. We’re off to a great start — see the major media below — but the BIG opportunity is to take the message to other Canadian and U.S. cities. The S-T-R-E-T-C-H goal is to raise a total of $10,000 (or more) to go to another city, like Calgary, Vancouver or even Washington. You can help by spreading the word. Visual proof – Here I am in front of a poster at Bank and Slater. The shopkeeper came out to tell me that lots of people are posing in front of the poster — and he wanted to know more…. I told him to please go look at BANNED ON THE HILL on Indiegogo. And tell others to get their support! We bought street ad posters and online ads on The Hill Times and Rabble sites. We also bought a print ad in The Hill Times. May 29: The Posters Are Up In Ottawa! The S-T-R-E-T-C-H GOAL is to take the campaign to other cities. Calgary? Vancouver? Montreal? — Or maybe WASHINGTON, D.C. Which city would be most impactful?? Leave a comment letting me know what YOU think. Please help spread the word and bring more Free Speech Defenders on side! To take the campaign to more places we need to double, or triple the funds raised. May 26: 100% Fully Funded! Thank you to the one hundred and twelve funders who backed ‘Banned on the Hill’. We’re going to Ottawa because of your help. Take a bow! You did it! Feel good! 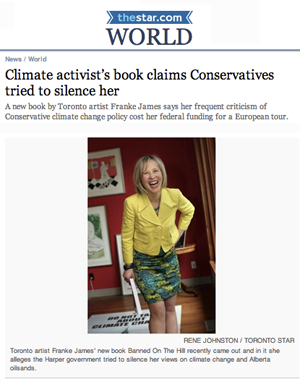 We are going to get people talking about climate change — and the undemocratic muzzling of environmental voices by the Canadian government. And we’re going beyond…. Today, another nine funders came on-board to join in the activist excitement. We’re now at $5,650. Tomorrow I’ll announce the S-T-R-E-T-C-H Goals for the next phase. Thanks for your support! Let’s show the Harper Govt that they cannot silence citizens. May 22: Perks are being delivered! ‘Banned on the Hill’ Perks are already being delivered! Encourage your friends to join in the activist fun… Banned on the Hill is making news. Stay tuned… Thanks for your help! 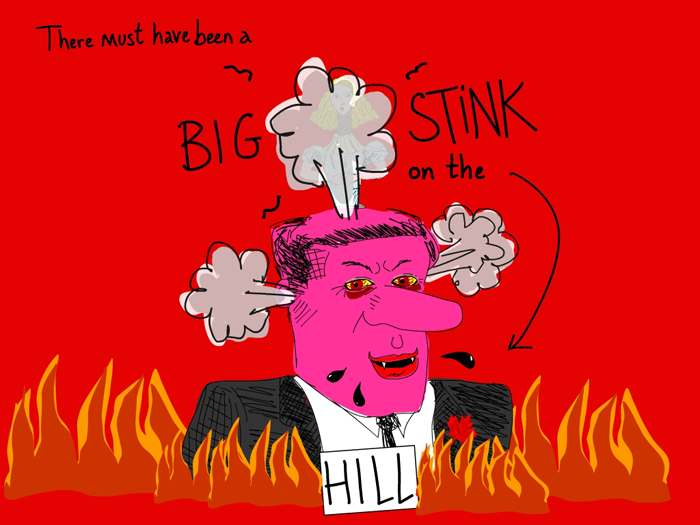 Your contributions to the ’Banned on the Hill” project are already being put to work. Today, thanks to 73 Indiegogo supporters, we succeeded in putting climate change at the top of a site that every Ottawa-insider knows and reads. The Hill Times is “Canada’s politics and government newsweekly” and their readers include “influential players in Parliament, Cabinet, the Prime Minister’s Office, the Privy Council,” and more. These banner ads are just a taste of what’s in store! Thanks for joining my activist campaign and helping to make a difference. 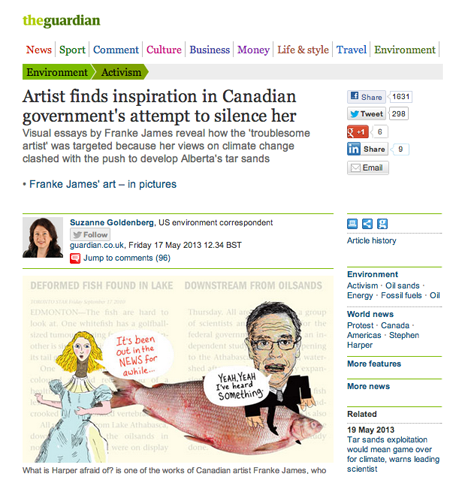 The Guardian also set up a gallery of 8 images. Please share this news with your friends and invite them to join my campaign by buying a book, or even chipping in a buck. Many thanks for fighting back by speaking up! 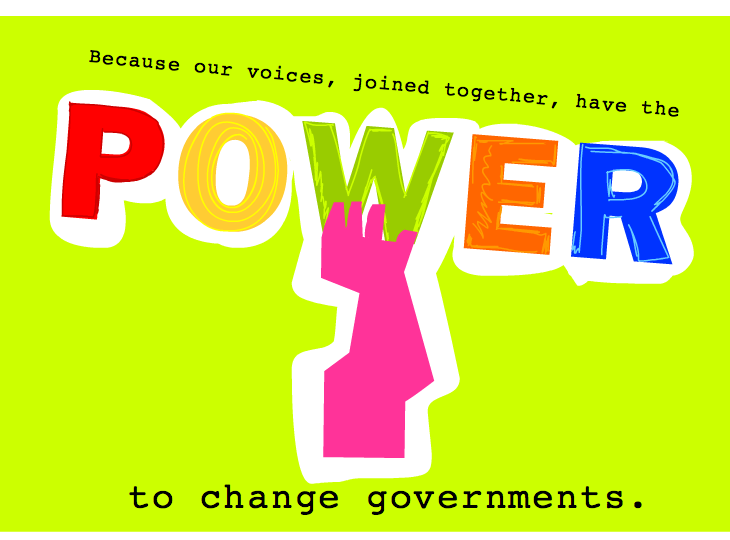 We have the power to change government by joining our voices together. Amazing news! Alternatives Journal Magazine is featuring a 3 page visual excerpt from “Banned on the Hill” in their May/June 2013 issue. This is getting pretty exciting! Thanks to everyone for your support. Here’s the design for the Outdoor Street Poster. 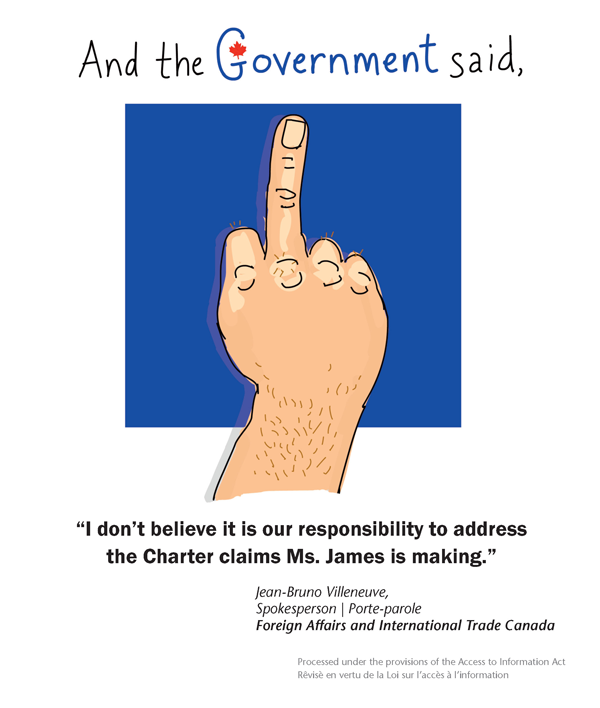 This will be shown in Ottawa and other cities. It is against government policy. The diplomat’s email inspired my ‘Bureaucat’ illustration below. Shockingly, the Government worked to shut down my show — and bully my supporters — simply because my climate change art was “advocating a message that was contrary to government policies”. Does this mean that ordinary citizens are not allowed to ask questions about government policy? Especially if they’re asking about climate change? If the Govt is not protecting my rights — or yours — who are they working for? Our rights are being squashed — and our country is being polluted — all to serve Big Oil. Scientists are being muzzled. First Nations are being pushed aside. Even our librarians are being told to shut up. The government cannot do this if we don’t play along. They can’t make ALL of us shut up. We have to fight back! For free speech. And for the environment. Please join my campaign. 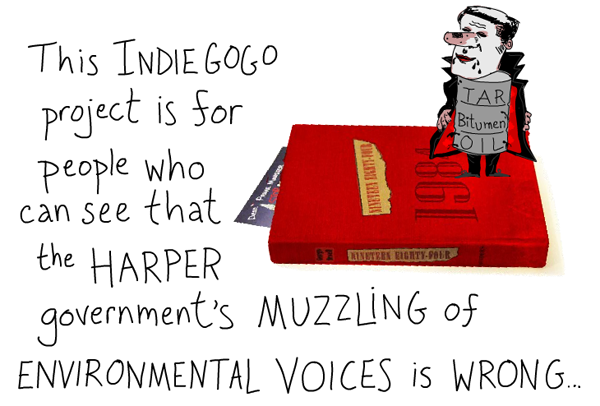 Tell Harper he can’t silence our voices. 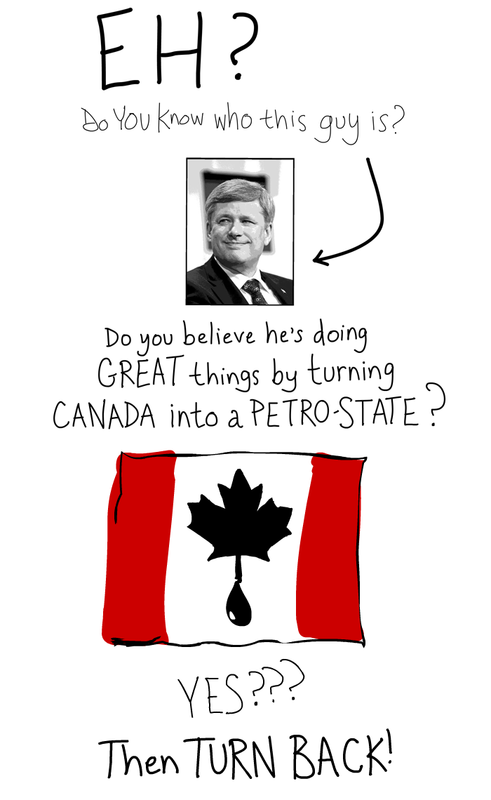 Together let’s tell Harper we’ve had our fill. We will not be, Banned on the Hill. Please go to Indiegogo to buy a book, or a perk and support the project! My new visual essay “What can Anybody tell Obama about the Keystone XL?” was just published on Grist, Vancouver Observer and my site… At the end, readers are asked to send a letter to President Obama. So far, over 1,000 ‘Anybodies’ have sent letters. I want you to add your name, too! In early February, I will be going back to Washington DC… And I want to make the most of the opportunity by dropping a bound copy off at The White House. The book will include a list of all the names of people who have sent in letters to the President. That’s cool, right? Please join me by sending a letter to President Obama from my story. Your name will be added to the book. 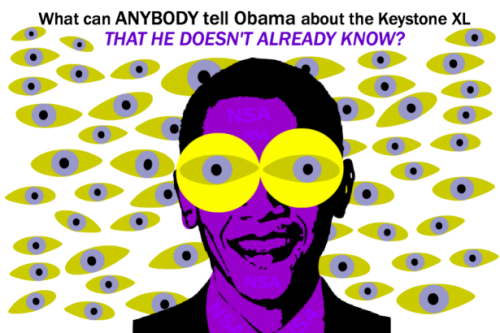 Read “What can Anybody tell Obama about the Keystone XL?” on Grist. Or find it on the Vancouver Observer, or on my Franke James site. Thanks again for supporting my Indiegogo ‘Banned on the Hill’ project! 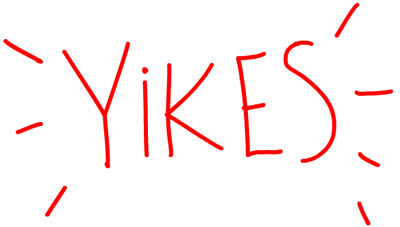 See this cool news on ‘5 Canadian artists who rocked in 2013’. It’s all thanks to you! Best to you for 2014!